Pope Francis gives the Christmas address and blessing to Rome and the world on December 25 at St. Peter’s Square. What’s behind the pope’s support for a two-state solution? 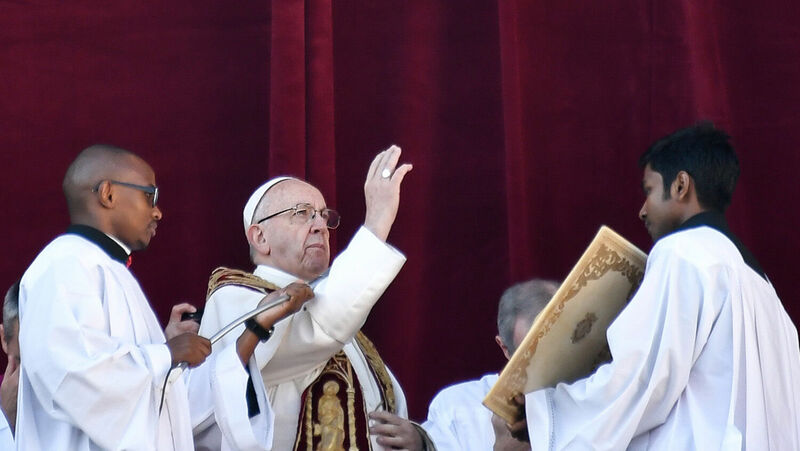 Pope Francis stood up for migrants around the world on December 24, saying Jesus Christ’s birth shows how foreigners should be welcomed with open arms. To stress his point, he likened Joseph and Mary to migrants struggling to find a home in a foreign land. The pope then stressed that many “other footsteps are hidden in the footsteps of Joseph and Mary.” He pointed to millions of persons around the world who are driven from their homes and said that Christ impels us to welcome migrants into a land of hospitality. The next day, Pope Francis likened the baby Jesus to the children of the Middle East who suffer because of growing tensions between Israelis and Arabs. This rhetoric sounds loving, but the comparisons Francis makes rely on faulty history to perpetuate a perilous double standard. Joseph and Mary were not migrants seeking a safe place in a foreign land. The Bible says, “Joseph also went up from Galilee, out of the city of Nazareth, into Judaea, unto the city of David, which is called Bethlehem; (because he was of the house and lineage of David:) To be taxed with Mary his espoused wife, being great with child” (Luke 2:4-5). Since Joseph was a descendant of King David, he had to travel to the city of his ancestral family to be counted and taxed by the Roman Empire. He stopped at an inn because his wife was about to give birth. But by the time the wise men came to see Jesus, Joseph’s family was living in a house in Bethlehem. As an adult, Christ spoke about the importance of being kind to the poor. But He never said the Christian faith impels people to welcome foreigners into their land without restrictions. Instead, he warned that the inhabitants of Jerusalem would fall by the sword in the end time when Gentiles would tread down the city (Luke 21:24). Catholic leaders often criticize Americans for not accepting more Mexican immigrants. They also criticize Jews for not accepting more Jordanian immigrants. But they never criticize Arabs for not accepting Jewish immigrants. Why the double standard? Currently, about 20 percent of all Israeli citizens are Arab. These Arabs have equal rights as every other Israeli citizen. But Palestinian leader Mahmoud Abbas says not one Jew should remain in Palestinian territory. So a two-state solution would mean a Jewish state with a thriving Arab minority, and an Arab state that has been ethnically cleansed of Jews. Pope Francis defends migrants—both legal and illegal—around the world, but he supports Palestinian leaders who are calling for every Jew to be purged from Israel. This perilous double standard is due to the fact that the Vatican has an agreement with the Palestinian Authority to transform Jerusalem into an international city. Pope John Paul ii and Palestinian leader Yasser Arafat signed this agreement at the Vatican on Feb. 15, 2000. At the end of the day, the Vatican does not want Jerusalem controlled by Jews or Arabs. Catholic leaders want Jerusalem to be an international city, controlled by some third party. If that third party was composed largely of European nation states, the Roman Catholic Church would see its control of Jerusalem’s Christian sites greatly enhanced. Jesus Christ warned that “when ye shall see Jerusalem compassed with armies, then know that the desolation thereof is nigh” (Luke 21:20). In the Old Testament, the Prophet Daniel refers to the “the desolation” as “the abomination that maketh desolate” (Daniel 11:31; 12:11). This abomination will be a military siege led not by the Jews or the Arabs, but by another power called the “king of the north.” This northern king will be closely allied with the Roman Catholic Church. To understand these prophecies more completely, please request editor in chief Gerald Flurry’s free booklet Jerusalem in Prophecy. Many political and religious leaders claim a two-state solution will bring peace to Jerusalem. Yet the Bible warns, “For yourselves know perfectly that the day of the Lord so cometh as a thief in the night. For when they shall say, Peace and safety; then sudden destruction cometh upon them, as travail upon a woman with child; and they shall not escape” (1 Thessalonians 5:2-3). The real lesson of the life of Christ is that mankind does not know the way to peace apart from God. That is why the world so desperately needs the Second Coming of Jesus Christ.